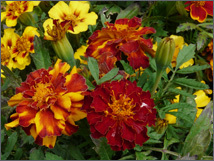 At Farnham Common Nurseries we offer a wide selection of bedding plants which are seasonal. Come in, and we can give you some ideas for containers, and tubs. Let us plant up your hanging baskets for you, to give all year colour, and interest. We have colour combinations which would suit a small pot, right up to a large border giving a riot of colour. Get in touch by giving us a call or by completing our online enquiry form for further information on the wide variety of bedding plant we have to offer. For every visitor who signs up to our gardening club.